The NHL trade deadline isn’t until tomorrow, but the market has been active already. Pittsburgh made big upgrades for a deep playoff run, the Blues beefed up their blueline, and Jaromir Jagr will call Boston “home” for the next couple of months. The New York Rangers started making moves of their own on the eve of the deadline, adding San Jose Sharks winger Ryan Clowe to the mix. In return, San Jose receives a 2nd and 3rd round pick in the 2013 draft, and a conditonal draft pick in 2014. If Clowe resigns with the Rangers (his contract expires at the end of the season) or the Rangers win two playoff rounds, it’s a second round pick. If neither of those happen, it’s a fifth round pick. Clowe had a no-trade clause, but he knew his time in San Jose could be coming to a close. He told local reporters on Monday “I’m aware of what’s going on and anything happening with me has to go through me, so we’ll see.” According to agent Kent Hughes (via ESPNNewYork.com), it came down to the Vancouver Canucks and the Blueshirts. Rangers GM Glen Sather called him “a unique combination of size, skill, and toughness” in a released statement. While Clowe has yet to light the lamp this year, he still has 11 assists in 28 games and 65 shots taken (the most by anyone in the league without a goal). That doesn’t sound great, but he goes to the tough areas of the ice to try and score, something the Rangers sorely lack. He brings some grittiness that the Rangers lost this past off-season (79 penalty minutes), and offers some size at 6’2″ and 225 lbs. His best season came back in 2010-11, when he had 24 goals and 38 assists. In the postseason the same year, he had six goals and nine assists in 17 games. He ranks 9th on San Jose’s all-time points list with 271 points (101 goals, 170 assists) in 423 NHL games. The Rangers gave up three picks in the deal, but the Rangers have done an excellent job of building their current team with a balance of homegrown talent and trade/free-agent acquisitions. Their window to make a run at a championship is now, and for the next couple of seasons, those picks should be at the back end of their respective rounds. 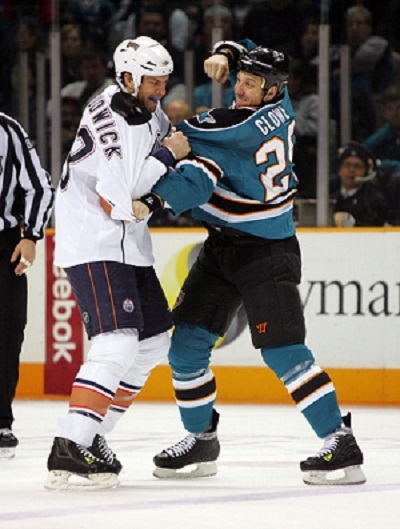 Clowe should make his Rangers debut when the Rangers host the Penguins at Madison Square Garden on Wednesday night.